Official Tour de France standings can be confusing if you are a new viewer or new to the world of professional cycling. Why are there teams if the race is won by a single rider? How can you tell who is in the lead? How are times measured and points tallied? What is a "stage" and why are there different winners announced each day? And what is the significance of the sea of colored jerseys being strutted around? To help you figure it all out, here is a mini-tutorial on Tour de France standings. To begin with, the Tour de France is a three-week bicycle race that winds throughout all of France. It is not only the longest cycling race in all of Europe, far surpassing the Giro d'Italia and Vuelta a España in both mileage and popularity, but the Tour de France is considered the most grueling and physically challenging event of any sport. The inaugural race, which took place on a much smaller scale with far fewer riders back in 1903, was an instant hit; since then, the Tour de France has become a household name all around the globe, attracting over a billion viewers each summer. The competitors are 20 to 22 nine-member teams (each team known by the name of its sponsor), who must be invited to enter by the race's organizing body, the Amaury Sport Organization (ASO). Each team designates a leader who is the contender for the title, however no cyclist can expect to win the Tour de France without the support of his team members. They work to shield the leader from the wind, to block riders from opposing cycling teams, to maintain leads by "bunch sprinting" and pushing the leader toward the finish line, and employ a whole series of permissible strategies to emerge victorious at the end of each day or "stage." Part of the route takes place over flat land, while in other parts of the Tour cyclists must tackle the ascents and descents of steep mountainsides, as well as neck-breaking speed sprints along winding roads. Hence daily Tour de France standings also announce the winner of the sprint race, who wears the green jersey; the winner of the mountain climbing race, who is dubbed "King of the Mountains" and who dons the polka-dot jersey; best rider under the age of 26, who is awarded the white jersey, and more. To decipher reports of the Tour de France standings, you'll also need to familiarize yourself with some Tour lingo, such as "peloton," "breakway," "domestique," "prologue," "slipstream," "general classification" (GC), and more. 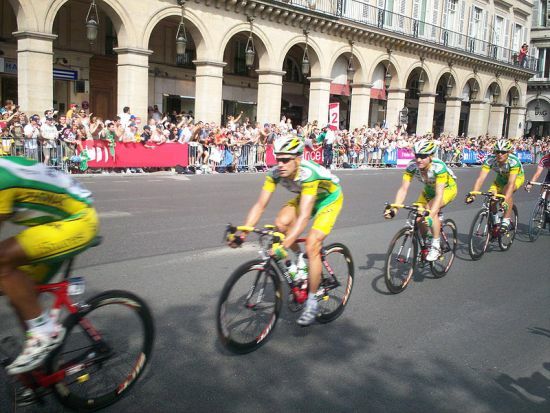 These terms are often used to describe the thrilling action and will help you appreciate the Tour de France even more.